The Kara-class, Soviet designation Project 1134B or Berkut B (golden eagle), is a class of guided missile cruisers (large anti-submarine warfare ship in Russian classification) built in the Soviet Union for the Soviet Navy. Though the Russian classification was "large anti-submarine warfare ship", the NATO lists the vessels as "cruisers" mainly because of the ship's Metel Anti-Ship Complex (SS-N-14 Silex) capable to strike not only submarines but also surface vessels. These ships were enlarged versions of the Kresta II class, with gas turbine engines replacing the steam turbines. These ships were fitted as flagships with improved command, control and communications facilities. These are dedicated ASW ships with significant anti-aircraft capability including both SA-N-3 and SA-N-4 surface-to-air missiles. The specifications for the class were issued in 1964 with the design being finalised in the late 1960s. The gas turbine engine was chosen instead of steam for greater efficiency and quietness, and because the main Soviet gas turbine plant had a long association with the Nikolayev shipyards. The cruiser Azov was constructed as a trials ship for the SA-N-6 missile system and was also fitted with the associated Top Dome Radar. During the Cold War she was confined to the Black Sea. These ships were built by the 61 Kommunar Shipyard at Mykolaiv (Nikolayev) on the Black Sea. Ochakov Очаков 19 December 1969 30 April 1971 4 November 1973 12 August 2011 Purposely sunk in channel of Donuzlav Bay 6 March 2014. Kerch Керчь 30 April 1971 21 July 1972 25 December 1974 Out of service after fire in December 2014. In reserve. Azov Азов 21 July 1972 14 September 1973 25 December 1975 30 May 1998 Scrapped at Inkerman, Sevastopol in 1999-2000. Petropavlovsk Петропавловск 9 September 1973 22 November 1974 29 December 1976 26 February 1992 Sold for scrap in 1996. Tashkent Ташкент 22 November 1974 5 November 1975 31 December 1977 3 July 1992 Sold for scrap in 1994. (Таллин) 5 November 1975 5 November 1976 31 December 1979 5 July 1994 Sold for scrap in 1994. ^ Chant, Chris (2004). Warships Today. Summertime Publishing Ltd. p. 98. ISBN 0-7607-6700-9. Gardiner, Robert (ed.) (1995). Conway's all the World's Fighting Ships 1947-1995. London: Conway Maritime. ISBN 0-85177-605-1. OCLC 34284130. CS1 maint: Extra text: authors list (link) Also published as Gardiner, Robert; Chumbley, Stephen; Budzbon, Przemysław (1995). Conway's all the World's Fighting Ships 1947-1995. Annapolis, MD: Naval Institute Press. ISBN 1-55750-132-7. OCLC 34267261. 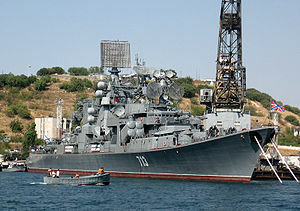 Wikimedia Commons has media related to Nikolaev class cruiser. This page was last edited on 3 March 2019, at 07:23 (UTC).